As I wrote in the previous post, I just concluded a week as Local Arrangements Chair for the ACSAC conference. Part of my responsibility was to coordinate some form of dinner entertainment. 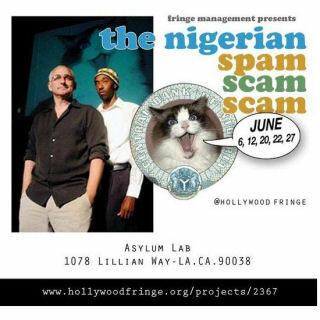 Luckily, the Hollywood Fringe Festival made that easy, for it was there that I discovered The Nigerian Spam Scam Scam, the duologue based on a true incident. My purpose here is not to review the show again. Rather, I want to talk about something specific to ACSAC — something that made me learn the stresses a producer faces. What stress? Well, consider that in the audience for this show we had a Nigerian Senator (from the newly elected opposition government), and two representatives from the National Assembly Antimoney Laundering & Cybersecurity Coalition of Nigeria. Yes, it is a real organization. How would they react to this show? Would they find it funny? Would they sue us? What have I done? So, Dean and Victor do the show. Many people are rolling in laughter (especially Gene Spafford, who wants to now book them for a phishing conference). The Nigerians? Straight-faces. They go up and talk to Dean and Victor after the show. Oh, what we would have given to be a fly on that wall. It turns out that they were worried the audience would believe the actors were portraying real Nigerian officials, and that people might thing the government was behind the scam. We (including one Nigerian student) worked to convince them it was clear that wasn’t the case. This was a true incident, with the words as written in the emails, that was perpetrated by scammers who are running the good name of Nigeria through the mud. We also worked to convince them that the best way to fight the problem was with the truth. If you read the linked article from the Nigerian News Service, it noted that the goal of the organization is to align Nigeria with the global initiative against terror financing, cybercrimes, currency trafficking and money laundering. The organization was born out of the realization that huge financial losses through such financial crimes had become a threat to the nation, and that the collaboration with strategic partners, particularly the central bank, was to discuss ways to align foreign exchange operations with international best practices. Lastly, in line with the anti-corruption drive of the president, the coalition aimed to meet the expectations of Nigerians to kick out crimes denting the image of the nation internationally. The upshot of this is that the Nigerian delegation is interested in presenting a case study next year telling a major technical conference the work that Nigeria is doing to prevent crimes such as this, and other forms of fraud that hurt their country. Step back now, and look at this in perspective: A show from the Hollywood Fringe Festival, presented at a long standing technical conference, has served to encourage a government to tell the world broadly that the image the world has of them is wrong, and that they want to be in the forefront of fighting this type of crime. The power of theatre. As Dean says at the end of the show, “mic drop”. ← Previous Previous post: A Dinner Costs How Much?! ?